Guide and information of Japan travel, with transportation from Narita, Haneda Airport by JR, Keisei Skyliner, Limousine bus. Asakusa is one of the must walks while you are in downtown Tokyo, old Edo tradition and culture you may encounter. Easy access to many popular sightseeing spots to/from Ueno (3 min. ), Akihabara (5 min. ), Tokyo main station (15 min. ), Ginza (16 min. ), Roppongi (20 min. ), Shinjuku (25 min. ), Harajuku (25 min. ), Shibuya (26 min. ), and you can also take ferry from Sumida River Park to the Tokyo Bay area (Odaiba area). Nikko and Kinugawa Onsen, Kawaji Onsen, Yunishigawa Onsen, can be reached by direct train on Tobu Line from Asakusa station. 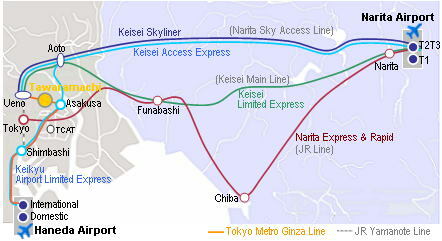 There are also direct connections to/from Narita Airport and Haneda Airport.